Broiled Grapefruit with Vanilla Ginger Coconut Cream + Sea Salt | A sweet and salty, maple broiled grapefruit with vegan coconut cream and a touch of sea salt. 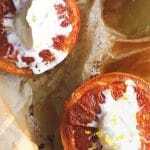 A beautiful, wintry, unfussy, baked grapefruit dessert. 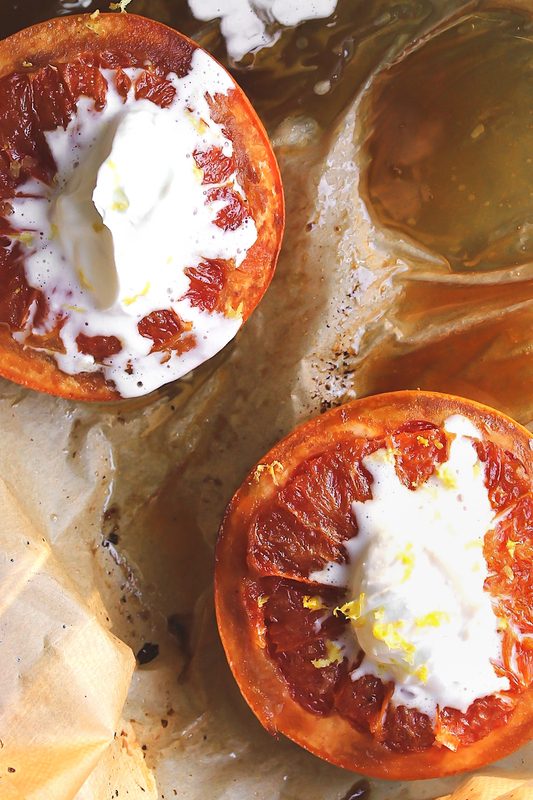 Refined sugar-free salted broiled grapefruit with vegan coconut cream. I want to travel as much as I can. I want to spend all of my time outdoors. I want to live in my garden. With my hands in the dirt. I want to take picnics. I want to go on road trips. With the wind in my hair. But until then I will be relying on bringing brightness into my life in citrus form. I have been living off citrus. Mandarins, clementines, oranges, lemons and limes. And, especially grapefruits. They are reliably abundant this time of year. And full of vibrance. I simply cannot get enough. I’ve been spending most of my afternoons snacking on raw ruby reds with a touch of honey and a pinch sea salt. Yes, salt. Not sugar. And flake salt if you have it. Trust me. The salt balances out the grapefruit’s sharp and sometimes bitter notes beautifully. I first started doing this after I fell in love with the greyhound cocktail a few years ago. Maple sweetened, broiled grapefruits are elevated to a whole new level with the pairing of this vanilla ginger coconut cream. It’s sweet and warm, and then salty and cool. There are so many layers happening here in just one bite. It’s simple enough for weeknights or afternoon snacks, but complex enough for a winter dinner party dessert. This is best served warm out of the oven, and melty with the coconut cream on top. I've made this with both fresh and ground ginger, and I found that ground ginger tastes best. The cream can be made ahead of time. Store it in an airtight container in the refrigerator for up to 5 days. Set the oven to broil, and line a baking dish with parchment paper. Halve the grapefruits, and place them in the dish cut side up. Cut each grapefruit's flesh by tracing the perimeter and each segment with a knife. This will make it easier to scoop out and eat after it has been broiled. Drizzle on the oil and 3 tablespoons maple syrup. Broil on high for about 10 minutes or until bubbly and slightly browned. Pull it out of the oven, cool for 5 minutes and sprinkle on the flake salt. Prepare the coconut cream while the grapefruit is under the broiler. In a small bowl whisk together the ginger, vanilla and remaining 1 tablespoon maple syrup and set aside. 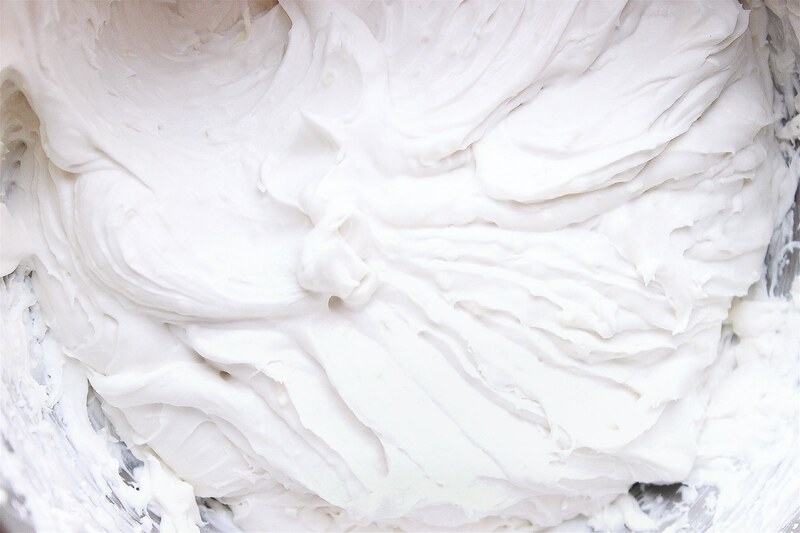 Then whip the coconut cream in a small bowl with a hand-mixer until it's blended. This will take only a few seconds. Then fold in the ginger mixture until well-combined. Serve warm with a dollop of coconut cream and lemon zest. « Thai Stuffed Sweet Potatoes with Red Curry Peanut Sauce for 80twenty! Love these photos. They are so moody and shadowy. I could look at them for a really long time. I eat a lot of baked grapefruit, always with a little maple syrup or brown sugar. But never with sea salt. Really looking forward to doing this! For the first time this week, I’ve begun to feel the first faint hints of spring in the air and I’m super excited too. I love your plan of living outside as much as possible – I need to make that happen in my life too. I’ve not yet tried this grapefruit/sea salt combo and I need to asap! Right there with you on the no-fussy meals, especially when its gorgeous outside (60s and 70s all week in Denver say whaaaaaaat!!!). 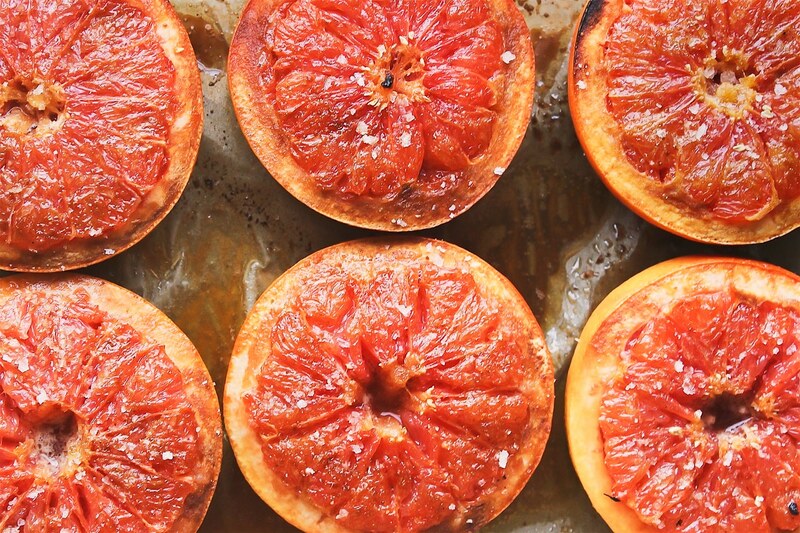 I am a grapefruit addict, but have never tried one broiled – or with salt! This flavor combo sounds amazing, I’ll so have to give this a try soon. Oh, I can’t wait to try this – and also your blackberry mango salad with earl grey whipped cream. Both sound perfect right now. I’m so eager for spring and sunshine and days spent outside too. Love grapefruit any way I can get it. Have had it broiled with sugar or salt, both good. What caught my eye is the coconut cream. Has flavors I love and looks fabulous! Your photos are wonderful, but I am disappointed I can’t just stick my finger in there and taste the food too. As it is a cold and snowy here in the middle of Wyoming. Happy to find these recipes and your site! Thanks for a bright spot in my day, and the anticipation of spring. Thanks for such a kind and sweet message Lori! I have made this twice, and I just can’t get enough. I love the creaminess of the coconut whip with the tart/sweetness of the citrus. So genius! This is one of my favorite ways to eat grapefruit, which I do almost daily between December and March. It’s an obsession, no doubt. 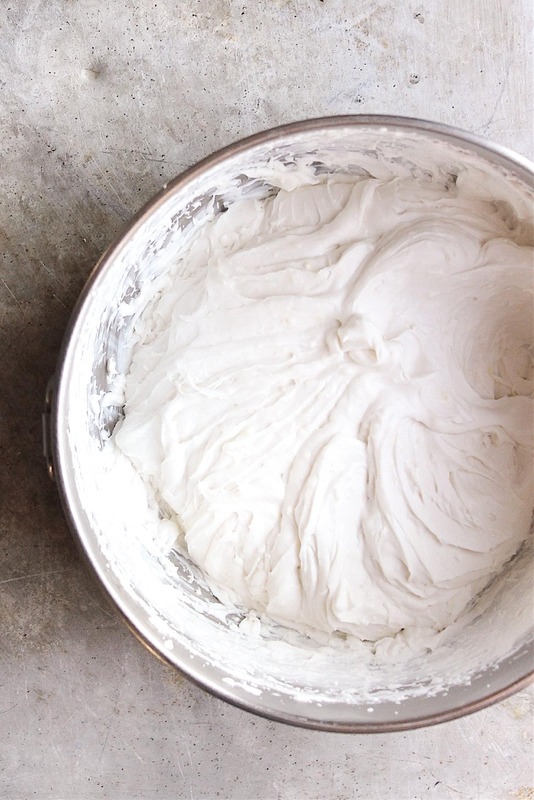 I’ve yet to make a coconut whipped cream, despite seeing it everywhere but maybe that needs to change. What’s not to love about that?